Your Infiniti is a luxury vehicle that puts you in charge of the road. It’s enticing design and swift acceleration makes for a ride that is worth getting excited about. At Hollin Hall Automotive, we want to keep your Infiniti running smoothly so you can enjoy the power and comfort of the car you love. Our ASE Certified technicians utilize state-of-the-art technology and diagnostic tools to take care of all your Infiniti auto repair and maintenance service needs. 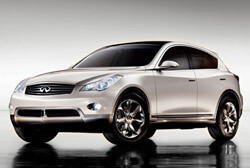 We are as passionate about your Infiniti as you are, and are excited to be your Infiniti dealer alternative.